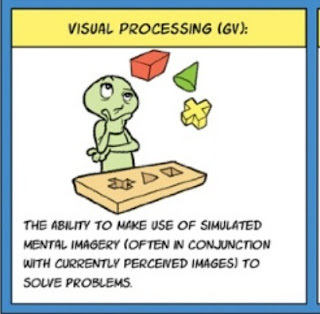 Visual Processing (Gv): The ability to make use of simulated mental imagery (often in conjunction with currently perceived images) to solve problems. Once the eyes have transmitted visual information, the visual system of the brain automatically performs a large number of low-level computations (e.g., edge detection, light/dark perception, color-differentiation, motion-detection, and so forth). The results of these low-level computations are used by various higher-order processors to infer more complex aspects of the visual image (e.g., object recognition, constructing models of spatial configuration, motion prediction, and so forth). Visualization (Vz). The ability to perceive complex patterns and mentally simulate how they might look when transformed (e.g., rotated, changed in size, partially obscured, and so forth). In the same way that Induction is central to Gf and Language Development is central to Gc, this is the core ability of Gv. Speeded Rotation (Spatial Relations; SR). The ability to solve problems quickly using mental rotation of simple images. This ability is similar to visualization because it involves rotating mental images but it is distinct because has more to do with the speed at which mental rotation tasks can be completed. Speeded Rotation tasks typically involve fairly simple images. Closure Speed (CS). Ability to quickly identify a familiar meaningful visual object from incomplete (e.g., vague, partially obscured, disconnected) visual stimuli, without knowing in advance what the object is. This ability is sometimes called Gestalt Perception because it requires people to “fill in” unseen or missing parts of an image to visualize a single percept. Flexibility of Closure (CF). Ability to identify a visual figure or pattern embedded in a complex distracting or disguised visual pattern or array, when knowing in advance what the pattern is. Visual Memory (MV). Ability to remember complex images over short periods of time (less than 30 seconds). The tasks that define this factor involve being shown complex images and then identifying them soon after then stimulus is removed. Spatial Scanning (SS). Ability to visualize a path out of a maze or a field with many obstacles. This factor is defined by performance on paper and pencil maze tasks. It is not clear whether this ability is related to complex large-scale real-world navigation skills. Serial Perceptual Integration (PI). Ability to recognize an object after only parts of it are shown in rapid succession. Length Estimation (LE). The ability to visually estimate the length of objects. Perceptual Alternations (PN). Consistency in the rate of alternating between different visual perceptions.. Imagery (IM). Ability to mentally imagine very vivid images. Small scale brain imaging studies have suggested that visual spatial imagery may not be a single faculty, rather, visualizing spatial location and mentally transforming locating rely on distinct neural networks. This research suggests a transformational process versus memory for location substructure. An objective versus spatial imagery dichotomy has also been suggested as well as the possibility of quality and speed of imagery abilities. The above definitions were abstracted from Schneider and McGrew's (2012) contemporary CHC theory chapter in the form of a special CHC v2.0 publication. See the chapter for more in depth information regarding this ability domain and contemporary CHC theory. Prior definitions in this series can be found here. Thanks to Dr. Scott Barry Kaufman for permission to to use the above graphic depiction of this CHC ability. 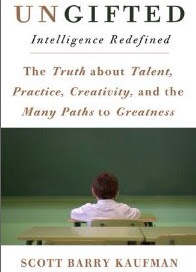 These CHC icons are part of Dr. Kaufman's book, Ungifted: Intelligence Redefined, and are the creative work of George Doutsiopoulos.